Franken took the lead Friday, but the recount is far from over. Thousands of withdrawn challenges still have to be allocated, wrongly-rejected absentee votes need to be counted and the Coleman campaign filed another petition to the Minnesota Supreme Court calling for the court to stop the counting of what the campaign calls double votes. Al Franken took the lead first thing this morning and the margin grew steadily as the board continued to process ballots challenged by Norm Coleman's campaign. After the process was completed, Franken attorney Marc Elias said he was confident that Franken would win the recount by double digits. "There is absolutely no doubt at this juncture that Al Franken has received more votes than Norm Coleman in the completion of the recount," Elias said. But Coleman's campaign said Franken's lead is only temporary. They said it will be erased when the canvassing board meets again early next week to count the ballots the campaigns initially challenged but then accepted. For his part, Senator Coleman said he's thinking positive about the outcome of the race. Coleman spoke with MPR after a speech at a National Association of Home Builders Conference in Brooklyn Park. "I've been confident the whole way," Coleman said. "We've been ahead through every stage and I believe we'll end up that way. But in the end, let's just get this process taken care of. I think the folks in Minnesota deserve some resolution and I think we're heading in that direction hopefully we'll get there soon." Coleman's campaign attorneys may be hindering that quick resolution. The campaign filed a petition with the Minnesota Supreme Court. They're asking the court to block the canvassing board from including what the campaign contends are double-counted ballots in the recount. Coleman campaign attorney Fritz Knaak said he thinks some original ballots and duplicate ballots were mixed in the recount. He said that's evident because some precincts recorded higher vote totals in the recount than were reported on Election Night. He said as many as 130 ballots may have been double counted. "In order to preserve our rights, and more importantly, the rights of Minnesota voters, we've gone to the Supreme Court to seek a remedy that will preserve and protect the integrity of this process and not allow the addition of more votes than were actually cast to be included in the final recount numbers," Knaak said. The Coleman campaign filed the motion just hours after the canvassing board decided not to take up the issue. Members argued that it wasn't their jurisdiction to handle the matter. Franken's campaign called the Coleman court filing a desperate attempt to prevent votes from being counted. The outcome of the race will become much clearer early next week when the State Canvassing Board announces the allocation of several thousand challenges that have been withdrawn by the two campaigns. Throughout the week, both campaigns have been withdrawing and restoring disputed ballots, making it difficult to determine which candidate will be ahead at the end of the process. But now that the five members have gone through hundreds of disputed ballots the major work of canvassing board is done. "It feels great," said Secretary of State Mark Ritchie. Ritchie said he's pleased that the canvassing board got over what he called the biggest hurdle for the recount. But he said there is still plenty of work to do. "We have a lot of different things to do," he said. "We need to be thinking about our responsibility for the question of the wrongly-rejected absentee ballots. We need to be assembling the data from the withdrawals and the judgments or decisions from the State Canvassing Board itself and putting it into the spreadsheets." Ritchie has to meet with the two campaigns and local elections officials to determine the best way to identify any absentee ballots that were wrongly rejected. 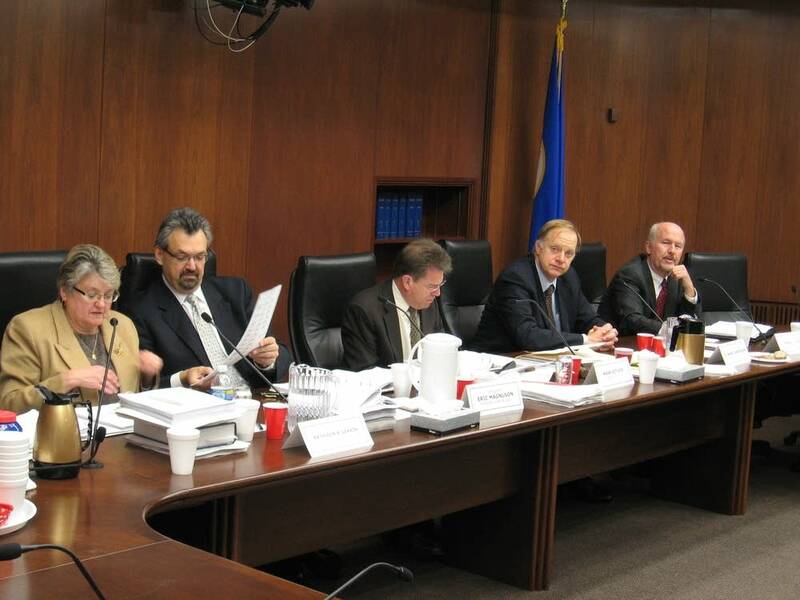 The Minnesota Supreme Court ruled on Thursday that the ballots must be counted but a standard has to be created to identify those ballots. Local elections officials have until Dec. 31 to report any revised totals to the State Canvassing Board. Meanwhile, Governor Pawlenty said his office has been researching the possibility that he may have to appoint someone to the seat if it's declared vacant. "All that we have done is begin to look at the law so that if it became necessary, and it would only be a temporary appointment - I don't want anybody to think that it would be more than the limited time until we got the recount done," Pawlenty said. "We're just looking at the laws to see how you do it so we don't get caught flat footed if it becomes necessary." It may be unlikely that the Senate will declare a vacancy even if no one is declared the winner when that body convenes on Jan. 6. The Senate could hold the seat open, appoint someone on a provisional basis or name a senator on its own accord.